Sometimes, the people with the least in life actually have the most. If you loved Tuesdays with Morrie by Mitch Albom, you will enjoy Life Is So Good. It is the inspiring and heart-warming memoir of George Dawson. George Dawson is a seemingly ordinary 101 year-old man. If you haven’t read this book, you’ve probably never heard of him. That’s a pity, because George is quite remarkable. He was born into poverty in 1898, the grandson of slaves. He grew up in the deep south of America at a time when racial discrimination was rife. He never went to school and started working as a young boy to support his family. He worked on farms and in a sawmill and helped to build the railroads and the Mississippi River levees. And he taught himself to read at the ripe old age of 98. He’s a glass half-full kind of guy. This book is a great pick-me-up. 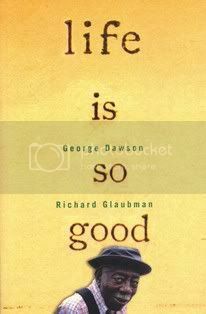 I read it several years ago and I still think of George to this day. It demonstrates the power of the human spirit, the importance of focusing on the positive and left me feeling warm and fuzzy inside. Would you like to read Life Is So Good? This book shows you that regardless of your age you can do wonderful things if you indeed beleve in yourself..To learn to read at such an 'old' age is almost like giving someone a whole new world. Great book. Hi UK, agreed. Glad you enjoyed the book.